Volume 2 of The Dark Side of the Moon moves from Howard Dean’s ‘excellent chance of becoming the next president of the United States’ to the aftermath of Hurricane Katrina, the evisceration of Medicaid and the exposure of the Jack Abramoff scandal. But what else was going on while Howard Dean opened the door and stood aside for John Kerry? All the frantic rhetoric of a presidential election year played out against two wars not going all that well, super-charged profits driven by rocket-fueled debt and the beginnings, the first itchiness around the American collar that all was not well deep down in the state of the union. What was on the national mind as Hurricane Katrina formed in the Gulf? 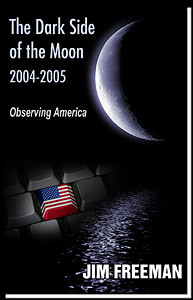 Volume 2 of The Dark Side of the Moon frames the state of national disconnection, observing America within the context of those events. Jim Freeman runs and operates a time machine. When I step inside this book, I feel like I'm instantly transported to a specific moment in recent American history, tethered to the past but cut off from the objective hindsight of future experience. Freeman's words are astute, wide-ranging and conversational, like sitting down with your favorite political pundit for a cold beer, spicy nacho chips and salty repartee. His contextualization of the past is both historical, thoughtful and personal.